Should you add discussion forums to your blog or website? 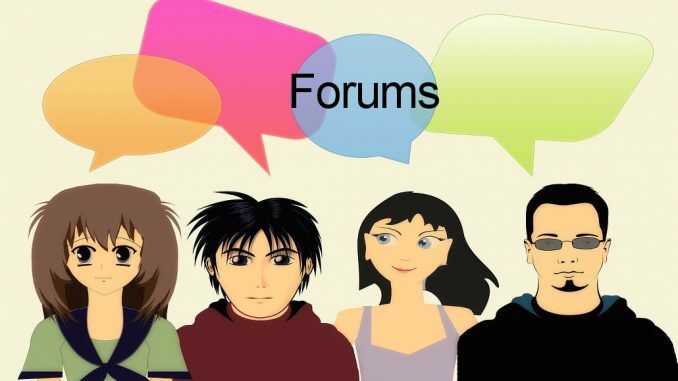 Would your WordPress website or blog benefit from having discussion forums? How do you set up the forums? What can they be used for? What are the pros and cons? Read on for the answers. Some websites are purely discussion forums with no other content, but that is not what I am looking at here. In this article I look at integrating discussion forums into an existing WordPress blog or website as an extra feature. You might want support forums for people that buy products or services from you and it is a way to interact with and help customers. It gives customers the opportunity to post messages and get help. You could have public discussion forums to attract visitors to your site and the forum topics could reflect the content of your site. You could have private forums that can only be accessed by members, such as people that have bought courses or other things from your site. Forums could replace comments on posts. Do you have comments a the foot of every post on your blog or website to encourage feedback? Many sites do and comments are a great way to get your visitors talking about the topics covered in your posts. Visitors can read a post and then immediately comment on it. Comments can generate replies, both from you and from other visitors and they can become an important source of extra information or ideas. Comments are immediate and on the page. Discussion forums are separate from the content of a site and they are in their own section. This site shows an example of this and RAWinfopages forums are here. If people want to discuss a post or topic they have to leave the current page, go to the forums, open the right one, then create a topic. It puts a barrier up that might put off some people from commenting on a post. Discussion forums require more effort by the visitor. One advantage of forums is that they can grow and take on a life of their own. As mentioned earlier, some websites are simply discussion forums with no other content. People visit the site because of the discussions and forums can draw a lot of people in. Discussion forums on your site, when successful, draw extra visitors and they could become as popular as your most read posts. Once forums get going and have lots of active members, they generate their own content and you don’t need to spend time creating posts to try and draw visitors to yor site. Forums can become self-sustaining with people creating topics and others replying and discussing them. They can become a valuable source of information as people share tips, problems to solutions and other information. Forums are easy to set up, but they are difficult to get started, in other words to build up an active membership that is posting and discussing. It is hard to build forums to the point where they become self sustaining and generate their own content. At launch on day one you will probably be the only member of your forums and there may be just one post, a welcome message from you or a rules post. When your first visitors arrive and see no discussions, they may leave and never return. You might need to get family and friends to post some content in your new forum to get them started. Forums can involve you in a lot of extra work, moderating the content and removing spam and spammers. Spammers use every opportunity to post their junk and forums are no exception. If you set up forums on WordPress, it will not be long before a spammer finds it and starts posting. What can you do? Some forums integrate with Akismet, the popular anti-spam plugin and it works the same way as for post comments. Every time someone posts in a forum, the content is checked for spam before appearing on the page. Spam posts are filtered out automatically. bbPress and wpForo use Akismet. Look for Akismet compatibility or some other method of filtering out spam. For example, bbPress uses the same filters as on the WordPress > Settings > Discussion page and you can create filters to hold back posts containing keywords or URLs until you have checked them. bbPress: This is the most popular according to the WordPress site and it has 300,000 active installations. The plugin itself is fairly basic and doesn’t have a lot of features, so it is one of the simplest and easiest to use. There are over 200 plugins for it that add extra features and functions, so although it is basic, you can build on it and add whatever you need. The plugins are probably one of the reasons for its popularity, as well as being free. wpForo Forum: This forum plugin offers more out of the box than bbPress and it has a good range of features. It offers three different forum layouts and six color styles, which means you can get it looking how you want. It has forum member badges and ratings, forum and topic subscriptions, and SEO functions to get you noticed by search engines. It has an excellent rating on the WordPress plugin site. Asgaros Forum: In terms of features, it probably sits somewhere between bbPress and wpForo. Although it only has 10,000 users according to the WordPress site, it has good reviews and a reasonable range of features. It has user groups, reporting and banning, as theme manager, uploads, search, and is SEO-friendly to mention just a few features. Discussion Board: Fewer active installations still, but this forum plugin is still worth considering. The demo boards on the site look good, although you need the paid Pro edition for some of the features there. It has good handling of users and you can make them verify their email, roles can be assigned and you can choose who can post and who can view. Simple:Press: With just 100 installs reported by WordPress and a single one-star review, you have to wonder what’s going on with this plugin. There is a demo at the developer’s website and it looks OK. However, the plugins must all be purchased, so it could end up costing a fair bit of money. Using it could not be simpler. Go to Forums in the sidebar and click the New Forum button. All that is needed is a title, but some introductory text can be added if you want. In fact, creating a new forum is like creating a post using the old post editor, not Gutenberg. Repeat this for as many forums as you want. That’s it, your forum is up and running and at the URL www.yoursite.com/forums. You need to tell visitors where it is of course, and you could put a link in the sidebar if your site uses one, add it to the foot of every post, or add it to the menu bar at the top of the site. 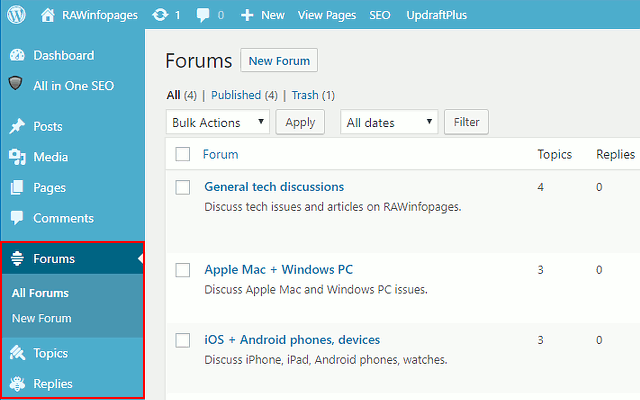 To see what’s new in your forums, just select Topics and Replies in the WordPress admin sidebar. They show lists that are similar to the admin Posts page, and you can see the title, author, date and so on. Mouse over a topic or reply and links appear below it that enable you to view it, edit it, trash it, mark it as spam. Go to Settings > Forums to configure the settings. The defaults are usually OK, but there are quite a few options, including two different forum layouts, post throttling to limit how fast people can post, whether to allow guest posters to require people to be logged in, and more. The forum can be set so that anyone can post, rather like the way they can with the comment form at the bottom of posts. You can also limit posting to logged in members. 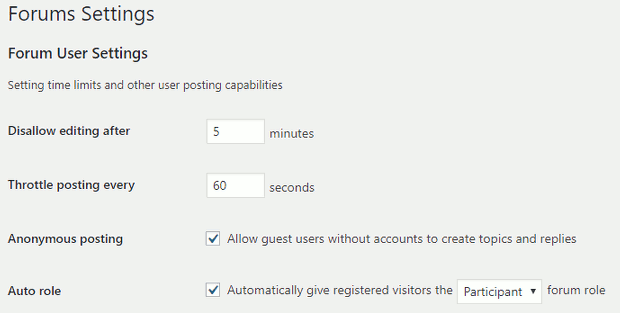 However, you must allow users to create user accounts on your site in Settings > General > Membership. Provide a link for them to sign up/sign in – www.yoursite.com/login. The bbPress plugin only installs a bare bones forum and you will probably need a few plugins to add the features you need. bbp style pack is a popular one and it enables the forum appearance to be changed. The first part hides the box requesting a user’s website when posting a topic or reply (the default WordPress comment form does the same – who uses it?). The second part sets the font size – feel free to change it from 13 to whatever you want. Don’t make the text too big though.